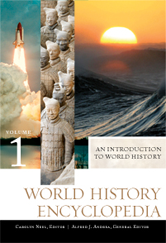 An unprecedented undertaking by academics reflecting an extraordinary vision of world history, this landmark multivolume encyclopedia focuses on specific themes of human development across cultures era by era, providing the most in-depth, expansive presentation available of the development of humanity from a global perspective. Well-known and widely respected historians worked together to create and guide the project in order to offer the most up-to-date visions available. How Does World History Differ from National and Regional Histories? Homo habilis—One Species or Two? What Do We Know of Neanderthal Social Life? What Happened to Homo erectus in Asia? How Do Our Nearest Primate Relatives Communicate? Why Is There So Little Very Ancient Art? Where Did the Zhou Come from? What Do Historians and Archaeologists Mean by "Complexity"? Was There War in the Indus Civilization? Where Did the Harappans Worship? The Earliest Egyptian Astronomical Records—Coffin Lids! Debating Hopewell Social Structure—Chief doms or Egalitarian Communities? A Historical Controversy—To What Extent Did Religious Pluralism and Toleration Prevail in Muslim Spain before 1000 CE? What Do We Know about Sub-Saharan Africa's Population? The Great Afro-Eurasian Pandemic—Did It Originate in Inner Asia? What Was the Population of the Caribbean and Mesoamerica before 1492? Death and Burial in the Latin East—Evidence of Cross-Cultural Interchange? Was There a Bilad al-Sudan? Gender Relations around the World —Does One Model Serve All? Centers of Religious and Secular Learning—Were the Great Academies Outside of Europe Universities? Baghdad, 1000–1258—Capital of a World Empire? Horses, Salt, Manufactured Goods, Islamic Books, Gold, and Slaves—What Was Traded across the Sahara and Why? Guy de Chauliac—The "Father of Modern Western Surgery"
Mississippian Mystery–Where Did the Moundbuilders Go? The Portuguese Discovery of Australia? The White Man's Grave—How Extensive Was Early Contact? China's Turn Inward—Did the Middle Kingdom Isolate Itself? The Chinese Porcelain Trade— "To Please the Eyes of the Europeans"
A Military Revolution or Evolution? Baldassare Castiglione and His Idea of the "Renaissance Man"
Youth Culture and Global "Cool"